Height: 12--24 in. Spacing:18-24 in. 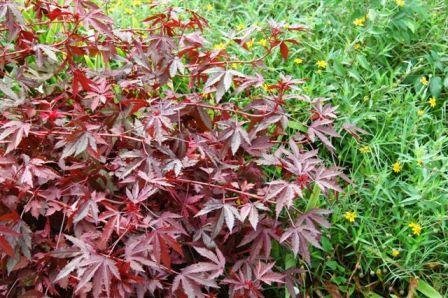 Foliage: Distinctive maple leaf shape with serrated leaves with incredible variegation of red, copper and pink. Notes: Drought tolerance and heat tolerance , Haight Ashbury is also deer-resistant. Mention the word “hibiscus” and thoughts probably go immediately to those fancy tropical treasures visible on exotic island vacations. Most mental pictures of hibiscus do not include small shrubs with fiery red leaves like a Japanese maple. That may be about to change, thanks to Maple Sugar and Haight Ashbury. Haight Ashbury has a distinctive maple leaf shape with serrated leaves and an incredible variegation of red, copper and pink. Its top attributes include drought tolerance, heat tolerance and deer resistance. Mississippi growers are on top of the curve when it comes to new plants. On a recent visit to one grower’s place, I saw a hundred or more gallon-sized plants called Haight Ashbury, a new selection of Hibiscus acetosella. Lately, when I have shown Haight Ashbury at talks around the state, people chuckle when they see the leaf and hear the name. Indeed, it does have some resemblance to marijuana in its shape, hence the name for that famous San Francisco location of the 1960s. Hibiscus acetosella is a tropical hibiscus grown mostly for its foliage -- at least that is why I like it. To me, the flower is inconsequential or, at best, a conversation item. The foliage is simply dazzling. It’s like getting to have a fiery red maple showing off all summer. It has common names like Cranberry hibiscus and False Roselle. The hibiscus variety Red Shield has been around longer than Maple Sugar and Haight Ashbury. Introduced by Proven Winners, Haight Ashbury has a distinctive maple leaf shape with serrated leaves and an incredible variegation of red, copper and pink. In some ways the variegation is a little reminiscent of a copper plant. The colorful red, purple or variegated foliage allows each of these hibiscus varieties to be grown with just about any other color of summer flower. The darker purple-red forms are awesome with ornamental grasses and zinnias like the Profusion series. I have seen some beds partnered wonderfully as a backdrop to gold coleus, pink pentas and New Wonder scaevola. You can use it in a cottage-style garden, or combine it with coarse-textured foliage like bananas as if you had a home on the island of Martinique. Plant Haight Ashbury in fertile, well-drained soil with plenty of sunlight. I actually think the plants look freshest and thrive most with a little afternoon shade protection. Drought tolerance and heat tolerance are two noteworthy attributes you will love about the plants, but there is one more description many Mississippians will be even more excited about: Haight Ashbury is deer-resistant. The plants will reach from 3 to 4 feet tall and have a cold-hardiness supposedly around 28 degrees. Literature has it all over the charts from the standpoint of cold-hardiness. Most say it is perennial from zone 9 to zone 11. Some report it is not uncommon to see some return in zone 8, but I am not promoting that. Grow it expecting it to freeze late next fall, but if yours comes back, let me know and we will celebrate together. Maple Sugar and Haight Ashbury are vegetatively propagated, meaning you will buy nice nursery-grown stock at garden centers. Red Shield more than likely will be found the same way, but seeds are available for this variety from specialty catalogs. Look for these new hibiscus selections this spring.